While you might be certain that your pet rabbit is adorable, you might have a hard time being certain about his communication methods, notably his body language. Circling behaviors are common in the rabbit universe, and can signify a variety of things -- often the drive to mate. When your rabbit circles your leg, it's usually a strong indication that the little guy isn't a baby anymore. He's reaching reproductive maturity and is able to reproduce, or at least is close to it. By circling you, your bunny is possibly indicating his urge to mate. The circling is actually a kind of wooing action, strange as it might seem. Some male specimens begin displaying these hormonal patterns when they're between 10 and 12 weeks old. Female bunnies bloom a little later than the boys. The females usually reach reproductive maturity around four weeks after the boys. Not all rabbit circling is of the embarrassing and awkward type. If you notice your rabbit rapidly circling your legs, it could mean that he wants something you have in your hands. If your bunny's nose detects that you have something yummy in your clutches, he just might zip around your legs as a means of getting you to notice him so that you give him some of it. If your rabbit wants you to look at him in general, he might try circling you. If you're unsure as to whether your rabbit's circling is a response to his frenzied hormones, be on the lookout for other clues that might help you figure out exactly what's going on. If he spritzes you with urine, then he's marking you and attempting to label you as being his own. That, too, is a typical hormonal action. If he trails you everywhere you go and makes subtle deep guttural sounds, then you have even more reason to think that the little guy is in the mood to mate. Rabbits sometimes focus these actions onto their human owners when they lack bunny company in their homes. Rabbits naturally circle fellow rabbits, as well. If your rabbit circles your legs and you're pretty sure it's because he wants to mate and not because he wants to snack, speak to your veterinarian about getting him fixed. Neutering and spaying rabbits generally minimizes or cuts out hormonal behaviors. Getting a rabbit fixed can be beneficial in many ways. It often reduces problematic behaviors such as urine spraying and fierceness, for example. 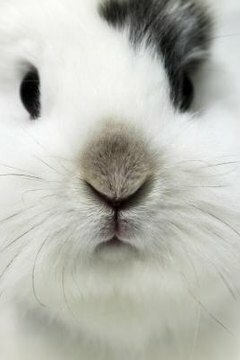 If you own male and female rabbits alike, the surgeries can stop the births of litter after litter of youngsters, all who need loving owners. Spaying can even have health advantages in many female rabbits. Uterine cancer is a common issue for intact females. University of Miami Department of Biology: Spay or Neuter My Rabbit? San Diego House Rabbit Society: Why Does My Rabbit Do That?